Any recommendations on how to tame an overgrown front garden that is primarily comprised of agapanthus, purple fountain grass, and fortnight lilies? 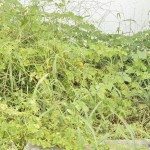 I'm a new gardener but per my reading I'm considering dividing all plants this fall and creating space for 5-year growth. I would go through and trim it all back. This way you can at least see what you have to work with. Also, remove any weeds that may be present. Division is a good idea and will help immensely.